Nigeria has secured the release of 82 more Chibok schoolgirls kidnapped by Boko Haram militants more than three years ago. The girls, according to government sources, were released today after negotiation with the militants. 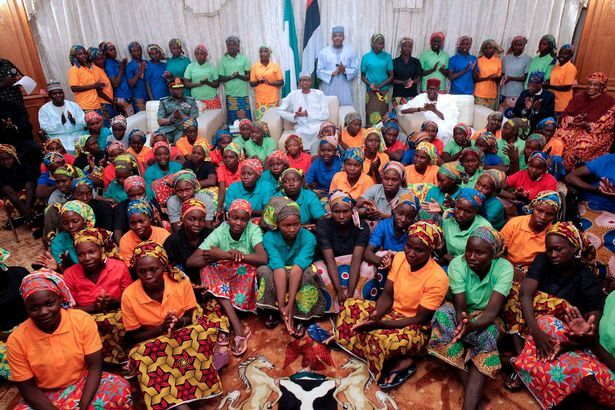 This brings to 103 the girls already freed the Boko Haram militants. The first batch of 21 were freed last october with the aid of the Red Cross and a Switzerland. two other girls walked into freedom on their own, making grand total of 105 girls freed from the clutches of Boko Haram. ‘They are now at Banki, a border town and will be flown to Abuja on Sunday”, a government source told NAN Saturday night. “The story is authentic’, added the source. The Bring Back Our Girls(#BBOG) Campaigners in a statement Saturday night also hinted about the release of the girls, although they said they were awaiting official confirmation. “We have been made aware of the yet-to-be-confirmed news that a number of our missing 195 Chibok girls in captivity have been released through negotiation”, said Sesugh Akume, spokesperson for BBOG. “It would be recalled that in October last year when the 21 were released, the Federal Government, specifically the Presidency said that 83 more were ‘on their way’. “We await official confirmation from the Federal Government and a release of their names. We shall go to work to confirm the news to verify its authenticity, and communicate same to the public. “Our hopes and expectations are high as we look forward to this news being true and confirmed”. Over 200 girls were kidnapped at Chibok Girls Secondary School on 14 April 2014, to the shock of many Nigerians and the international community. The Buhari administration since it came into office on 29 May 2015, has been working towards freeing all the girls still in captivity.